Why aren’t the Rifles more popular in the United States? It’s quite a shame, and honestly; everyone else is missing out on one of the most underrated British rock bands playing right now! Their last album “The Great Escape” was brilliant and practically flawless. Their follow-up to that album is “Freedom Run,” an excellent album recorded at Paul Weller’s studio and produced by Chris Potter. “Freedom Run” is different than their previous releases, but in a good way! One thing you notice right off the bat with their opening track “Dreamer” is how much their sound has matured. The band has slowed things down a bit to focus on the melodies & harmonies. They aren’t just breezing through their songs anymore, The Rifles are taking their time and I don’t mind. “Long Walk Back” sounds similar to their earlier material and think it’s a stand-out track. “Sweetest Thing” is a good example of the singing changes on the newest album. The singing on that track makes me think of the Beatles or Oasis (same thing really); I know I’m not the only one in thinking that either. I honestly don’t think that’s a bad thing because that track is another gem. The Rifles first single “Tangled Up In Love” was the first song I heard on this release and made me really excited to hear what else was in store with “Freedom Run.” I think it’s by far one of the best songs they have done to date. Catchy as hell and makes you want to play the song on repeat. I absolutely love that they included strings in the song. It’s a motif you will be humming for days! The second half of the album isn’t as strong as the first half but that doesn’t mean this album is a total stinker…it’s NOT! I just prefer the songs in the first half. There are still plenty of tracks to enjoy like “Nothing Matters,” “Coming Home” and the last song “Cry Baby.” One other stand-out is “Little Boy Blue.” It’s a 6 minute plus song that fans will either love or hate. I really like the song but it tends to get on the long side of things. I have music A.D.D. and need to have songs shorter usually. What I like so much about the new Rifles album is they aren’t afraid to take chances. They aren’t afraid to have a song longer than 3 minutes, or break out into a solo or two, or sound different than their other releases. I’ve been listening to this new album for a few weeks and it’s already up there with one of my go-to driving albums. It’s something about the melodies and the strumming of the guitars that makes this an excellent album to drive to. 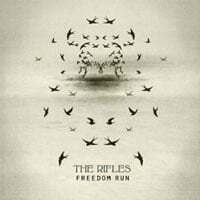 If you haven’t listened to the Rifles yet, I would recommend getting The Great Escape first and then make your way to Freedom Run. You’ll appreciate this new album a lot more if you did that I think. Bottom Line: The Rifles return with a stellar third album! !